Already into the semi-finals, should Galway and Dublin rest players this weekend? 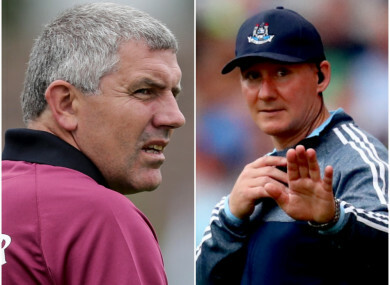 Kevin Walsh and Jim Gavin face a dilemma as the Super 8s conclude. THERE WERE A couple of kinks in the Super 8s format brought into the All-Ireland SFC this season. The first, the possibility of dead rubber games in the final round, was largely unavoidable. Dead rubbers, although unwanted, come with the territory in a round-robin format. Thanks to David Clifford’s last-minute goal in Clones in the previous round, Dublin-Roscommon is the only meaningless tie this weekend. The second flaw, which could have been prevented, comes down to the scheduling. The All-Ireland semi-finals take place on the weekend of 11/12 August, giving teams just a week to prepare for the biggest game of their season. The GAA would have been better off playing the round-robin games on three consecutive weekends and leaving a two-week gap to the semi-finals. The hurling provincial round-robin showed that playing on successive weekends can have a detrimental impact on a team’s performance when they play sides who are coming off a break. Traditionally, counties had three weeks to prepare for the semi-final games. It meant they had plenty of time to study the opposition, work on a game plan and tailor training sessions with the aim to peak physically in Croke Park. The new structure of the All-Ireland SFC has drastically changed that this year. Champions Dublin will be out in action just six days after they play Roscommon. Given they’re already assured of top spot in Group 2, Jim Gavin may consider resting some of his key players with one eye on next weekend. If Gavin went with his full hand against Roscommon this Sunday and one of his lieutenants like James McCarthy, Ciaran Kilkenny or Brian Fenton picked up an injury, it would look like a very foolish decision. Like Brian Cody with Kilkenny, Gavin doesn’t like to give out championship jerseys easily but these are exceptional circumstances. He did rotate his team for the last two Division 1 league games against Galway and Monaghan, with David Byrne, Ciaran Reddin, Colm Basquel, Paddy Small, Shane Carthy, Conor McHugh and Kevin McManamon all earning rare starts. It’s likely Gavin will opt to bring in a few fresh faces against the Rossies. Over in Group 1, Galway face perhaps an even bigger dilemma. They’re already assured of a semi-final spot but defeat to Monaghan on Saturday would send them through as runners-up and pit them against Dublin. Galway face a Farney side who need at least a draw to advance into their first semi-final since 1988. It’s up for debate, but Kevin Walsh’s side might prefer to avoid Dublin and give themselves the best possible chance of reaching a first All-Ireland since 2001. There’s a theory doing the rounds that Dublin never quite play to their maximum on All-Ireland final day. But might be down to the relentless Mayo teams they faced in 2017, 2016 and 2013, plus the dreadful rain that fell during the 2015 decider against Kerry. As Donegal showed in 2014, the Dubs might be vulnerable in semi-finals. Whether it’s Dublin, Donegal or Tyrone that Galway play in the last four, a week to prepare for a game of such magnitude is far from ideal. As Paul Conroy cruelly found out against Kerry a couple of weeks ago, a season-ending injury can strike any moment. Should Kevin Walsh risk losing momentum to keep star men like Sean Andy Ó Ceallagh, Tom Flynn, Damien Comer, Shane Walsh and Ian Burke in tip-top shape? If Galway do top the group, they’ll have an extra day to get ready for either Tyrone or Donegal on Sunday week. The runners-up clash with Dublin a day earlier on the Saturday. It all adds to the intrigue ahead of the final round of Super 8s games. Email “Already into the semi-finals, should Galway and Dublin rest players this weekend?”. Feedback on “Already into the semi-finals, should Galway and Dublin rest players this weekend?”.